For my visitors who aren’t already aware, our site has seen a significant dip in the google search results starting on Aug. 1, 2018. Google routinely updates their search results, sometimes as much as several times a day. This particular update (dubbed the “Medic Update” by some) had a massive effect on the search results, specifically in the health niche. I can understand their rationale completely. For a long time, there were plenty of sites that were ranking for heavily searched medical-like terms, that probably should not have been. They have a responsibility to their customers (you, the google searcher) to present the most reliable, informative, and accurate result to your query possible. With all that said, there’s been some strange results popping up when I run searches for keywords I used to rank for. These are not isolated incidents, and they are also not happening on deep pages in the results. In fact, they’re almost ALL happening on Page 1 of the results, and for literally 100’s of searches I’ve personally conducted. In many cases, these bad search results have almost completely taken over the page 1 results. There are a ton of search results that I did not include in the video, simply because of time restrictions. This is a joint relief supplement I wrote about awhile back. Our review is rich, and full of content regarding nearly everything there is to know about this supplement. I’ve personally tested the product myself, and had an older gentleman named Jim test it out as part of our STEPuP program. The purpose of that was to determine if there were major differences between the effects it would have on younger adults (like my 37 year old self), and older adults (Jim is 66 years old). We have 17 real reviews from users who have taken the product, linked to from the top of the page. We’ve even had the content on the page medically reviewed for accuracy by Dr. Helen Okoye, our in-house medical reviewer. Searchers are looking for real reviews of this particular product. 3 of the 10 results have nothing to do with the product at all, as well 2 of the youtube videos in the carousel. The first unrelated result (Amazon) is for a completely different product called Vital 3 Joint Solution. The second unrelated result (Consumerreports.org) is an outdated article from 2013 that makes no mention of the product named Arthrozene. Further down the page, in the 5th, 9th, and 10th spots, we have completely (almost) irrelevant pages showing up. My review is pinned to the bottom of the page in the #8 spot. For someone searching for real reviews of Arthrozene, this is not helping their cause. So Wachsen Riesig was a supplement I actually received a mailer on last month (October), of which I wrote a complete review on here. Apart from the mailer (and one lone BBB complaint), there was virtually no information about this supplement available online. I wrote the best possible review with the limited information I had. If you look at the review, this particular company uses extremely vulgar marketing materials to push their product. And I specifically called them out on that, along with many of their claims. If you run a search for wachsen riesig reviews on google, this is what shows up. Just like with the Arthrozene review search, the first several results have nothing to do with the search. The first result is an Amazon listing for a completely different product (which isn’t even available, btw), and unrelated articles on CBSNews.com and WebMD.com. My review is in the #5 position. For the past year or so, certain unsavory marketers have been pushing a fake ad about some miracle testosterone booster, weight loss pill, even wrinkle creams being seen on the TV show “Shark Tank”. The reality is, these two “sisters” (who aren’t even sisters) did NOTdevelop some miracle testosterone booster / ed pill / weight loss supplement. I’ve already outed them extensively in this article and this article. Searchers looking to find out info on this particular product may search several terms. That there was some miracle supplement that landed a huge deal on the show. If the searcher clicks on their result before mine, you could almost certainly bet that a good % of the searchers will believe what piop.net says before learning the truth. Unfortunately, our exposé has been pinned in the #3 spot for a couple of months now. I exposed this particular scam back in June of 2017, click here to read up on it. If you search for the term ‘conor mcgregor supplements fox news’, you’ll see another site ranking right up at the top. If you click on that result (which most people do), they go into this long story about how Conor McGregor used 2 supplements called Power Testo Blast and Power Muscle Blast. In fact, the only supplement McGregor has ever claimed to have used publicly was BSN Syntha-6 Edge, which he briefly mentioned in a Muscle & Fitness interview. Further down the results, we have this site perpetuating almost the exact same thing. On this particular url, they claim he is taking a hiatus from the UFC because he was taking some banned supplement named Stamimax. Where’s our review exposing the scam? This is another supplement that uses deceptive marketing to push their product. Just like with many of the others, they’ve been pushing the “Shark Tank Weight Loss” narrative. We outed the whole thing in an exposéwe published on October 15th. Yet, if you search something like “evolution lean keto shark tank“, you’ll see nothing but sites perpetuating the scam. Further down the results we have 2 Amazon listings that have nothing to do with the product, a blank page, and another url that perpetuates the scam. So where is my exposé warning people about this particular scam? Since buying Viagra over the counter is not legal (or recommended, even if you did find someone selling it! ), the user is searching for an “herbal equivalent”. It’s a very heavily keyword stuffed page, that really doesn’t provide any credible info on the search at all. What’s worse is, as you scroll a bit down the page, you’ll see a popup show up. 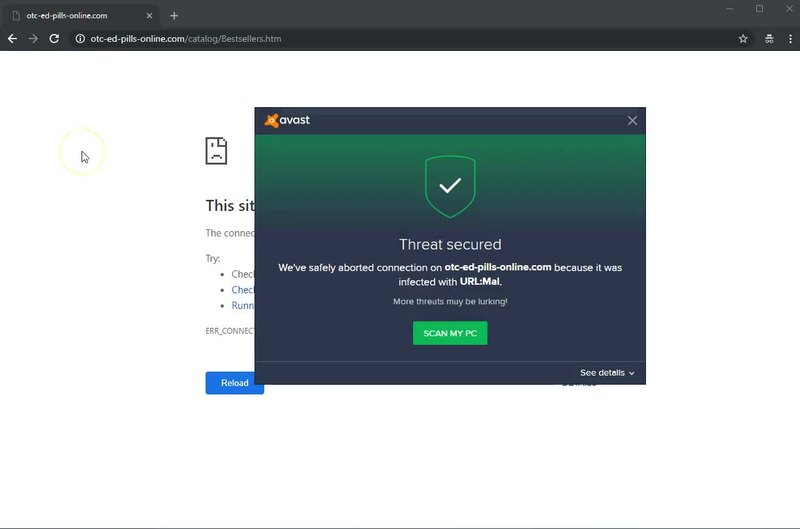 If you try to X it out, the entire page redirects and I get a malware warning from my virus protection software. Further down the page, you’ll see another similar result. While this page doesn’t redirect, it’s clearly a keyword-stuffed page that does not provide any credible information. 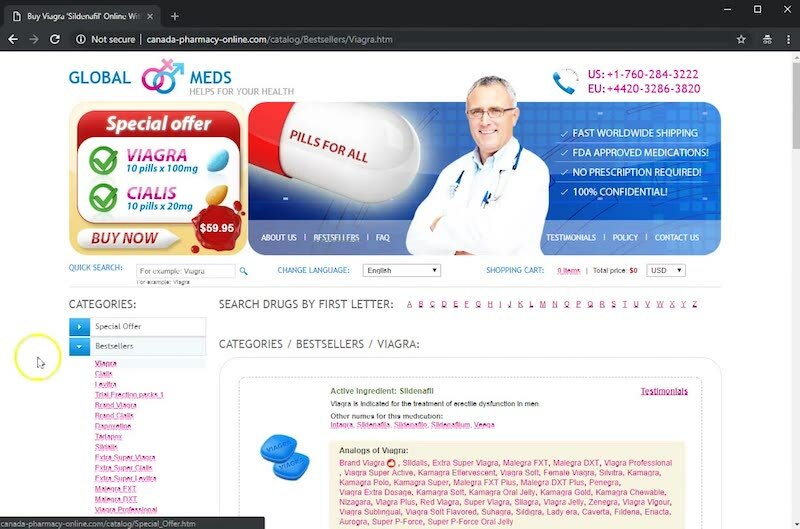 Well, “hotelmiramare.com” redirects to a totally different site selling fake Viagra. Another thing I’ve noticed was the resurgence of expired domains popping up. For example, one product I’ve written about extensively is a supplement called Vigrx Plus. If you search the term “vigrx plus reviews“, the very first result that shows is a domain name called mbpi.org. If you look at the history of this particular url on Archive.org, you’ll see that it used to be an environmental assessment website. In that same search you’ll see a site called “Hawaii-conference.com” showing up in the #5 spot. This particular url was redirected to a site called uhhconferencecenter.com, and had a ton of legit backlinks going to it. Those backlinks are what drive this particular url (and mbpi.org) to the top of the search results, not the quality of their content. Another site I’ve seen popping up all over the place is envisionsolutionsnow.com. This site used to be a full-service healthcare marketing communications consulting firm. ahcafr.com, which was originally an “Arkansas Health Protection Guide”. Brightfuturesforfamilies.org, which was originally a “national initiative for families and communities to promote and improve the health and well-being of children of all ages”. elasticss.com, which was a blog about elastic CSS framework of all things. mynvfi.org, which was originally the National Vitiligo Foundations website. This technique of buying expired domains and re-purposing them is nothing new. It’s been going on for as long as I can remember, I’m just very surprised to see this particular tactic working in 2018. I’m not exactly sure why google is ranking these types of sites, especially the ones in the video. Are they relying too much on links? My suspicion is yes, they are. For the longest time, whenever SupplementCritique.com experienced a traffic drop like this in the past, there was always one way around it: Write better content and make a better site. We’ve always strived to “do our best” and “do it the right way”, and make it a point to write informative, well-researched, and fun articles and reviews. However, with results like these showing up, I’m really not sure I could write anything better than I already have. It’s very disheartening to see results like these popping up, especially considering all the near-daily positive feedback in the form of emails and comments we get thanking us for “saving them” from a potentially dangerous or financially draining product. We’ve written numerous articles informing those who have been sucked in by a free trial, debunking potentially dangerous myths about ‘permanent enlargement pills‘, and countless others. Despite the setbacks, I’ll continue to do my very best at helping you find the best supplements possible. I always try to find a way to turn a black cloud into a silver lining, and this time is no different. If you have any questions, you can always reach out to me here.